This page gives information for staff using Questionmark Perception to deliver exams in 2018-19. It contains important information regarding editing your exams in the future. Since December 2017 iSolutions has been copying your assessments onto the Questionmark OnDemand Cloud service so that students can take their exam on a modern, up-to-date assessment system. 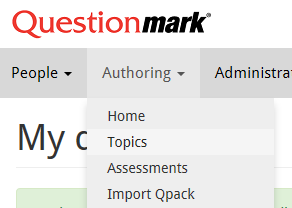 In 2018-19 your questions will be copied over, and assessment recreated so that Questionmark OnDemand becomes the home for your exams. Questions created and edited in the cloud now use a single easy-to-use screen. It is harder to create a question incorrectly and quicker to generate new items. All questions are now version controlled and can be rolled back. You will be asked for a “revision comment” when editing any question. iSolutions will copy your questions to the Questionmark OnDemand Cloud and will re-create your assessment. We are primarily doing this so that we can re-build the Topics folder to have questions grouped by Module Code. Questionmark Perception On-Premise is over ten years old and has some questions in faculty folders, some in module folders and some in user folders (often under the username of a staff member who left years ago). When training new staff, we found that most users didn’t have any issues creating questions and that by creating assessments on their behalf we removed a significant amount of time for new authors. iSolutions checked over every part of the assessment during the scheduling process to check for mistakes, so creating the assessment correctly didn’t consume any more iSolutions time. iSolutions will create topic folders for you. You can create topic folders, but should only do so if you wish for us to create separate blocks in your exam. When creating your account, we will create a folder for your items. If you have asked us to, we may have imported some questions from previous exams. Sign in to OnDemand and choose “Authoring” from the top menu and then “Topics”. Click the arrow next to your course folder and click on this year’s academic year (e.g. 2022-23). To edit a question click on its name. Your question will appear, you can edit any element of the question by clicking on the text. You can only delete a question if it has never been used in an assessment. As iSolutions will create an assessment as part of the conversion process you probably will not be able to delete questions yourself (for this year). Edit the description of the question to say “RETIRED: question name“. This will help you see that the question is deleted as it will still appear in your list. Press OK, then Save and Edit. You will need to make a revision comment, this can be “Retired question”. 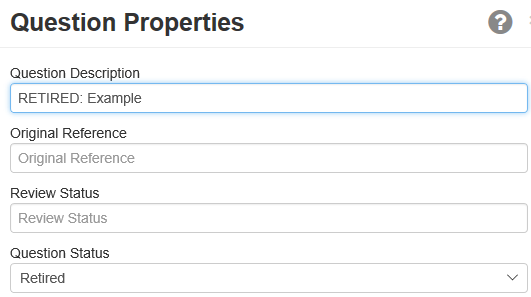 Changes made in the Topics area of OnDemand are not automatically updated in students’ exams. If you edit a question, you must ask iSolutions to republish your exam.